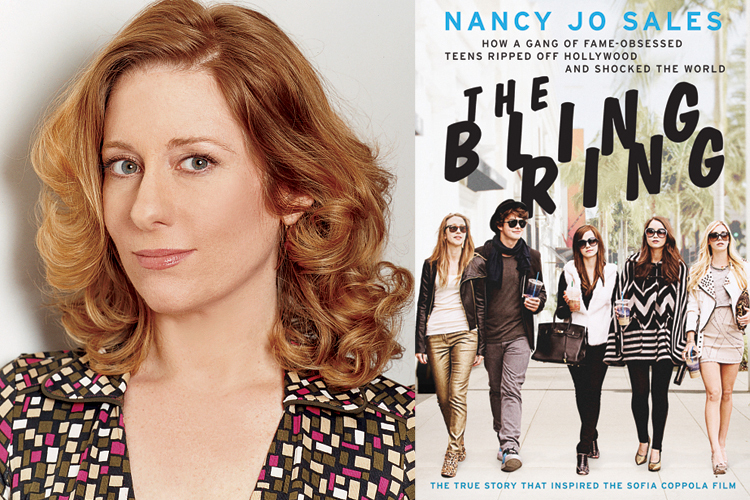 In 2010, today&apos;s interviewed published an article in Vanity Fair called "The Suspects Wore Louboutins," which now you can read in a longer form in a new book called The Bling Ring: How a Gang of Fame-Obsessed Teens Ripped Off Hollywood and Shocked the World as well as see in a soon-to-be-released movie by the same title directed by Sofia Coppola and starring Emma Watson. Nancy Jo Sales is an award-winning journalist, editor and author who has written for Vanity Fair, New York, Harper&apos;s Bazaar and many other publications covering subjects like Angelina Jolie, Hugh Hefner, Russell Simmons, Taylor Swift, Tyra Banks and Paris Hilton. You can read a lot more about her here. What were some of the challenges of turning the article into a book, aside from the quick turnaround time? The sheer physical effort was pretty intense. I felt like I was running a marathon. I didn’t sleep very much. The book was constantly running through my head, which was both interesting and distracting. You were on the other line of one of my favorite Soup clips of all time, so I have to know, what did Alexis’ final voicemail actually sound like, and were you surprised by her reaction to the piece? I was surprised that someone who was being charged with burglary was upset that I had allegedly misidentified her shoes! I found the whole thing very confusing. Those particular starlets have faded—although Paris seems to be enjoying a little comeback with The Bling Ring movie—but I don’t think our culture’s focus on celebrities has diminished at all. If anything, I think the amount of celebrity “news” (which isn’t really news), celebrity talk, and trash talk has increased. I already thought of Paris Hilton and Lindsay Lohan as being a bit desperate in terms of fame, so the Bling Ring were somewhat bottom feeders of celebrity. What was the victims’ reaction to the thieves’ becoming famous? In the book I quote Paris calling them “scumbags” [and] quote from the grand jury testimony in which the celebrities describe coming home to find their homes ransacked. The thieves took tons of stuff—“bags and bags” of stuff, says Audrina Patridge. They developed a method where they would go in, find suitcases, and start filling them up. So, even though these celebrities were famous, privileged people, I think their testimony shows how they were true victims of serious crimes. And they all seemed very traumatized by it. Lindsay said she was so freaked out she could never return to the house they robbed, and she didn’t. Party girls are not a recent innovation: are there any “famous for being famous” starlets of old that you think an Alexis Neiers could benefit from reading up on? “Party girls” started with the flapper era, really. Joan Crawford was maybe the original party girl, known for dancing on tables in nightclubs, just like Paris Hilton. The 30s had many movies about high-spirited heiresses getting into trouble (including It Happened One Night). The real party girls of Hollywood who didn’t achieve that kind of Crawford-level fame often met bad ends, including Virginia Rappe (who died at a wild party in San Francisco; Fatty Arbuckle was charged with accidentally killing her) and Elizabeth Short (“The Black Dahlia”). How much did Sofia Coppola consult with you prior to or while making the film? What parts of the movie seem distinctively her as opposed to the story you covered? We met several times in New York while she was writing the script. We talked about the story and the characters and the themes in the story, i.e. celebrity obsession, social media obsession, materialism and conspicuous consumption. We talked about kid culture today. The movie is like a roman a clef, a thinly veiled account of the facts. The basic story is there but the style and atmosphere is all Sofia. What are some of your favorite other sidelong looks at the nature of fame in pop culture? The Day of the Locust by Nathanel West, the movie To Die For with Nicole Kidman, Sunset Boulevard, of course, and Lisa Kudrow’s brilliant show about a reality star, The Comeback, to name just a few. Fame is such a theme in American culture, there are so many. I know from speaking to other celebrity profiling reporter friends that it’s a job that’s not as glamorous or glitzy as it looks, but I always have wondered how one does become a writer who is entrusted to eat lunch with Angelina Jolie. What were the first few stories that broke you through to being a trusted celebrity reporter? As a young freelance reporter I started doing these really small Q and As for the New York Times Magazine in the mid-90s. Somehow I got assigned Jerry Lewis and John Cleese. I love them both, and in both cases what was supposed to be a 15 minute interview turned into like two hours. They made me laugh. I still have Jerry’s fax to me after the interview, which says, “It was fun today…. Thank you for a great sense of humor.” I cherish it. For those aspiring to do what you do, what have been some of the most important lessons you’ve learned about how to interact with celebrities and what to expect when you write about them? Just be natural and listen, and don’t have an agenda. I try and forget everything I’ve read about this person at the moment of the interview and just let them tell me about themselves. How does it feel to be the 351st person interviewed for Zulkey.com/WBEZ?